materials with improper certifications. An understanding of the regulations, their areas of application, and interrelationships helps prevent costly mistakes. This article discusses the passive fire protection requirements for insulation products installed onboard marine vessels, along with the regulatory framework and relationship between the various regulations. Application of the regulations to various vessels is then illustrated through examples of different vessels used in different operational activities. Self-propelled vessels over 500 gross tonnes involved in international trade are subject to the IMO Safety of Life at Sea (SOLAS) requirements.1 Similarly, Mobile Offshore Drilling Units (MODUs) involved in international operations are subject to the IMO MODU Code requirements.2 In addition to these international regulations, many countries—known as flag states—have their own requirements for vessels. For U.S.-registered vessels, the United States, through the USCG, implements the requirements contained within the Code of Federal Regulations. In addition, many individual vessels are “classed” with a marine classification society, and are thus subject to additional class society requirements. Many of the Classification Society rules are aligned with the IMO regulations. Vessels that hold a SOLAS certificate are required to comply with the SOLAS regulations. Specifically, the passive fire protection requirements affecting the use of insulation products are contained within SOLAS Chapter II-2, entitled “Construction ? Fire Protection, Fire Detection and Fire Extinction.” Relevant SOLAS regulations are noted below. Reg. 4.4.3: In spaces where penetration of oil products is possible, the surface of the insulation shall be impervious to oil or oil vapours. Reg. 5.3.1.1: Insulation materials shall be non-combustible, except in cargo spaces, mail rooms, baggage rooms and refrigerated compartments of service spaces. Reg. 5.3.1.1: Vapour barriers and adhesives used in conjunction with insulation, as well as the insulation of pipe fittings for cold service systems, need not be non-combustible materials, but they shall be kept to the minimum quantity practicable and their exposed surfaces shall have low flame-spread characteristics. Reg. 6.2: Paints, varnishes and other finishes used on exposed interior surfaces shall not be capable of producing excessive quantities of smoke and toxic products. The average surface thermocouple temperature rise does not exceed 30 C.
Low flame-spread materials are tested in accordance with FTP Code Annex 1, Part 5, using the test apparatus and procedures outlined in IMO Resolution A.653(16).5 Materials that satisfy the surface flammability criteria listed in Figure 1 meet the low flame-spread requirements. Materials that are required to be not capable of producing excessive quantities of smoke and toxic products are to be tested in accordance with IMO FTP Code Annex 1, Part 2. 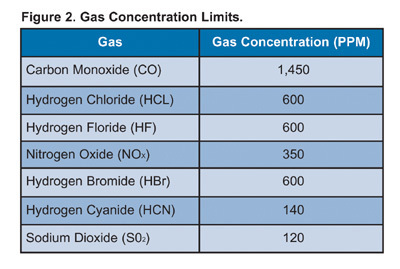 The optical density and concentration of seven toxic gas species are measured following procedures outlined in ISO 5659-2:1994.6 Figure 2 lists the maximum permissible concentration of each of the seven species. Vessels that are registered in the United States and involved in domestic service are subject to the U.S. domestic requirements as outlined within the U.S. Code of Federal Regulations (CFR), specifically Title 46.7 Additional guidance is provided within individual documents including Policy File Memorandum (PFM) 1-008 and Navigational and Vessel Information Circular (NVIC) 9-979 published by the USCG. Applicable domestic service regulations vary, depending on the category of vessel. A selection of insulation products and their associated USCG approval categories are listed in Figure 3. The regulatory environment for insulation products in a marine setting can be complicated due to different international, domestic, and classification society requirements. An understanding of the applicable regulations and the specific fire test requirements can ensure that the appropriate products are specified and installed on each vessel. 1. International Convention on the Safety of Life at Sea (SOLAS), 2000 Amendments, IMO, London, England. 2. Code for the Construction and Equipment of Mobile Offshore Drilling Units, Resolution A.649 (16), 2001 Consolidated Edition, IMO, London, England. 3. International Code for Application of Fire Test Procedures, Resolution MSC. 61(67), 1998, IMO, London, England. 4. Reaction to Fire Tests for Building Products: Non-combustibility Test, ISO 1982: 1990, ISO, Geneva, Switzerland. 5. Recommendation on Improved Fire Test Procedures for Surface Flammability of Bulkhead, Ceiling and Deck Finish Materials, IMO A.653 (16), IMO, London, England. 6. Plastics ? Smoke Generation ? Part 2: Determination of Optical Density by a Single-Chamber Test, ISO 5659-2:1994, International Organization for Standardization, Geneva, Switzerland. 7. Code of Federal Regulations, Title 46, Shipping, U.S. Government Printing Office, Washington, D.C., U.S.A. 8. Policy File Memorandum, PFM 1-00, Implementation of the FTP Code, USCG, Department of Homeland Security, Washington, D.C., U.S.A. 9. Guide to Structural Fire Protection, Navigational and Vessel Information Circular, NVIC 9-97, USCG, Department of Homeland Security, Washington, D.C., U.S.A. 10. Recommendation on Fire Tests for “A”, “B” and “F” Class Divisions, IMO A.754 (18), International Maritime Organization, London, England.